What do we know about the history of Scotch whisky? Oh we’re diving into a deep subject there… the first written reference to Scotch whisky was in 1495: an order for eight bolls of malt for Friar John Cor to make aqua vitae, or uisge beatha in Scots Gaelic – whisky. There were a lot of unlicensed distillers for a time, before the Excise Act in in 1823, which made it harder for illegal stills to operate, and that’s when a lot of distilleries started to establish themselves and pay tax. I always think it’s funny when you look at a bottle of whisky that says Established in 1823 – they were probably producing whisky a bit before that! But that’s when they started paying tax. There are three ingredients in 'single malt', and that’s water, malted barley and yeast. The barley is where we get sugars, which react with the yeast to create alcohol. That’s the same for any alcohol, really. With whisky then it goes on to be distilled – basically increasing the content of alcohol – which, in Scotland, is traditionally done twice. The 'still' is like a big kettle; when you boil the liquid, alcohol evaporates before water so that’ll vaporise and go up through the line arm to be condensed back into liquid. It gets to about 70% alcohol and then we lay it down in the cask for maturation. 'Single grain' distilleries – I think there’s about seven in contrast to the hundred-odd single malt ones – are more industrial and a lot faster. If you were to mix grain whisky and single malt you’d get a blended whisky. You can also get 'blended malts' – single malts blended together – or occasionally a 'blended grain' of just single grains. But to be a 'blended Scotch whisky', it’s grain and single malt. What should people be looking for when they buy a bottle? The label will always tell you if it’s a blended malt or a blended whisky, and where in Scotland it was made. There are five regions defined by the Scotch Whisky Association and there's always a bit of an argument as to whether regionality impacts the flavour. Traditionally I’d have said it does, but these days it’s quite hard to categorise. For instance, Speyside whiskies are known to be quite fruity, but now there are many smoky Speyside whiskies. If you’re looking for something really smoky, your best bet would be an Islay whisky, but there are non-smoky Islay whiskies out there too. Older doesn’t mean better, and you’ll find lots at the 10-15 year mark, because that’s where people have found a nice balance of flavours. I think the barrels are more important. In Scotland, you have to mature your whisky for a minimum of three years in oak barrels, which have usually had other liquids in them beforehand. Here at Raasay, we’re using barrels that once matured Rye Whiskey in America, or French red wine. So what was in before, and the type of oak that’s been used, can give you an idea of flavour. The most popular barrels in Scotland come from Bourbon and Sherry production; with ex-Bourbon you’d normally expect those softer, sweeter notes – hints of honey, caramel – while an ex-Sherry cask made of Spanish oak gives you dry fruits and spice. For people new to whisky, or who think they don’t like it, any tips on how to enjoy it? There are dedicated whisky bars all over the country now and you’ll find a lot of the bar staff are really knowledgeable. When I first got into whisky, I'd ask a few questions and they could suggest a few drams for me. The problem with going out and buying a bottle is if you don’t like it, you’re stuck with a full bottle. So I suggest getting talking about it, understanding it a bit better. Something like a 10-year Bourbon-cask whisky might be softer and sweeter to start – but if you don’t like the first one you try, don’t be put off! There are so many out there. Dare I ask – a drop of water? It’s your whisky – you should drink it how you like it! That might be with a splash of water, that might be with ice, or a tonic water. At the end of the day, it's made to be enjoyed. Whisky cocktails are very popular, and another good way to learn to appreciate it. I don’t like snobbery around whisky, and people turning their nose up when you add water to it. Maybe you don’t want to be adding tap water in a busy city; I'm lucky living in Scotland, our water is pretty good. One thing I’d say is you can’t take water back out, though, so maybe add a couple of drops at a time. Any recommendations on whisky/food combinations? Whisky and food is becoming very popular. Things that I think work really well are canapés, cured meats, hot smoked salmon, chocolates and cheeses… Spicy foods go well with a sweeter whisky, and gamier meats, like venison, work well with fuller bodied whiskies. I’m a big fan of whisky cranachan – if you put a big glug of whisky in the cream... And there’s whisky sauce (traditionally eaten with haggis) – although I find you can’t always taste the whisky that well in sauces – but maybe that’s because I’m used to drinking whisky! What do you like most about whisky? I love the social side of it, and just talking about it. Everyone’s different and has a different opinion on what’s good. If I’m in a bar and order a whisky, and someone’s there drinking one, it’s always a good starter for a conversation. I love the social side and the way it brings people together. 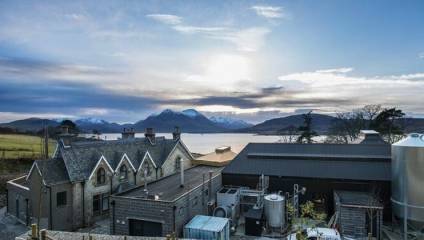 The Raasay Island Distillery Burns and Whisky Weekend includes dinner, lunch and an exclusive whisky tasting and warehouse tour with the distillery's co-founder, Alasdair Day. Book here. Read our full guide to Burns Night – including booze-free and vegan-friendly options! – for more ideas on how to celebrate.